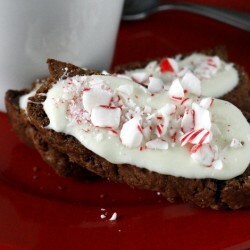 These chocolate peppermint biscotti are the perfect accompaniment for your cup of tea or coffee! Make this easy coffee shop favorite in your own home. 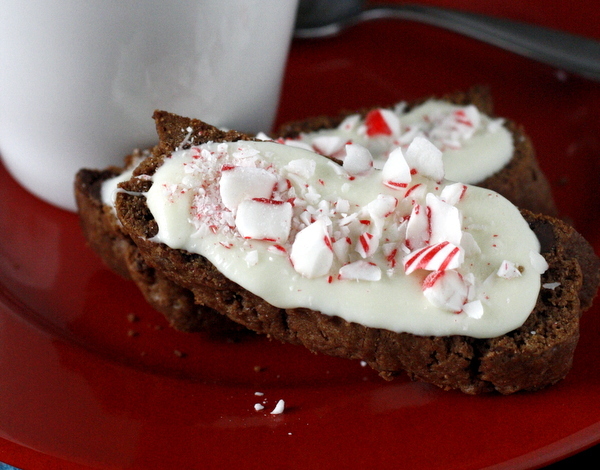 If you are a chocolate and peppermint fan (and a biscotti fan), you will love these chocolate peppermint biscotti! Of course I also had to dress them up a bit. 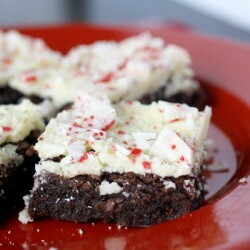 I added some white chocolate and crushed peppermint candy canes to give them more of a festive appearance and taste. Plus, you can never have too much chocolate, right? 🙂 I hope you enjoy these – we definitely did! 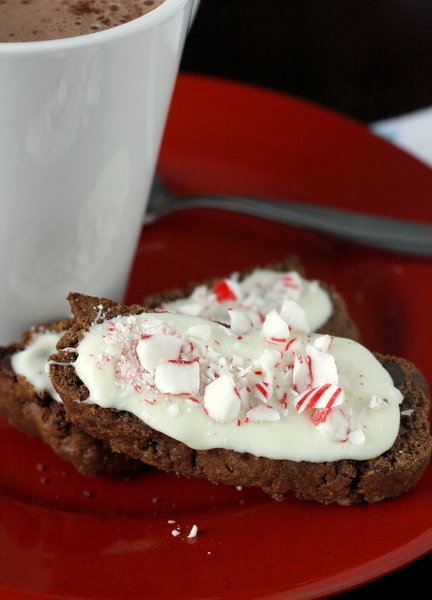 Chocolate Peppermint Biscotti are day 8 of the 12 Days of Christmas Treats! 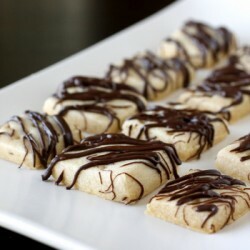 I will post a new cookie every day for the first 12 days of December. You can see all these recipes from over the years under my Christmas Cookies tag. 🙂 See all of this year’s cookies here: 12 Days of Christmas Treats 2015. Enjoy! And, as always, let me know if you try any and how you liked them. In a large bowl, cream the butter and sugar until light and fluffy. Add the cocoa and baking powder and beat for 2 minutes. Beat in the eggs one at a time, then stir in the flour. Mix the chocolate chips. Cover dough and chill for 15 minutes. Preheat oven to 375 degrees. Divide dough into two parts, and form each part into a 9 inch log. Place logs on lightly greased cookie sheet, about 4 inches apart. Flatten slightly. Bake for 20 to 25 minutes, or until toothpick inserted in center comes out clean. Remove from oven; reduce oven temperature to 325°F. Cool 10 minutes on cookie sheet. Carefully remove logs to cutting surface. Cut into 1/2-inch slices with sharp serrated knife. 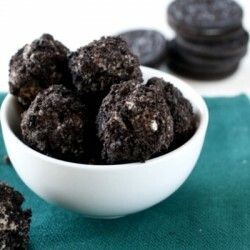 Arrange pieces on same cookie sheet, cut-side down and bake at 325 degrees for 9 minutes. Turn cookies over, and bake for 7 minutes more. Remove from oven to a wire rack and let cool completely. Melt white chocolate morsels according to package directions, Spread one side of each biscotti with white chocolate then sprinkle crushed candy canes on top. Allow chocolate to set before transferring to an airtight container. 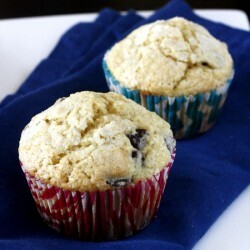 Look it very attractive, I want to eat it right now! Thanks so much for recipe!